Regular users of MusicRadar should be feline pretty familiar with Gibson's Dusk Tiger by now. We brought you sneak preview pictures, a gallery of press shots and, complete with genuine Bengal tiger, the promo video. Then when it arrived a few days ago we unboxed it before your very eyes. That's all lovely, but what does the damn thing actually sound like? Myriad options for digital tweakery make the answer to that question somewhat open-ended, but it does come loaded with preset tones based on some heavy-hitters from Gibson's back catalogue and some twangy Fender-style and piezo sounds too. This First Look video keeps things simple. The signal chain is as follows: Gibson Dusk Tiger - guitar cable - Marshall Class 5 combo - Shure SM57. 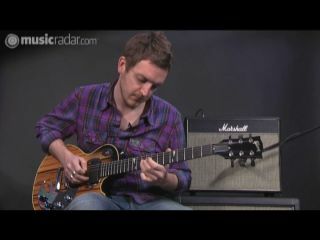 More Dusk Tiger videos live here, on the official Gibson website.